Cheesecake is regarded as one of the most keto friendly desserts. When you combine cream cheese, sour cream and heavy whipping cream you get the ultimate high fat dessert, so we couldn’t not make a keto version! Hold up, we didn’t only make one we made three, and this post is only the first version! We started with a Cashew Cheesecake, inspired by my mom. My favorite nuts are cashews, but having them in the house can be risky given my impulse to eat 15 servings in one sitting combined with their higher carb count. However, one day my mom showed up with a bag of cashews from the indian grocery. Everything from ghee to nuts is much cheaper at the indian grocery. We couldn’t turn away the nuts so it was on us to use a large portion of them in a new recipe! With a large bag of cashews from my mom and the cheesecake recipe in hand we combined the two to birth the most amazing dessert we have created up till this point! The cashew makes for the perfect crunchy crust for the decadent cheesecake filling. Interestingly, the cashew crust also has a creaminess and slight sweetness that you wouldn’t expect. I can’t believe we hadn’t been using them in desserts all this time! 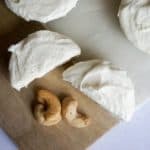 Not only are cashews my favorite nuts, but cheesecake has always been my favorite dessert so you can imagine why I picked this recipe as my favorite of all our recipes. Not to mention, the hardest part about making these is the wait time as they chill, making them incredibly easy to make! We opted to chill them in the freezer instead of the fridge so they set faster and can be eaten faster, but if you have the patience we would recommend the fridge. This might take anywhere from 2-3 hours. However, when storing we definitely suggest the fridge or they will harden to a bone and they will have to thaw hehe. No need to thank us after you’ve tried them. We know, and you’re welcome! Don’t forget to check out the other two versions! With a hand mixer mix together cream cheese, sour cream, heavy whipping cream and erythritol.